1 tsp (5 ml) pumpkin pie or apple pie spice or 2 tsps cinnamon in total. 3 tbsp (45 ml) shredded, sweetened regular coconut. 8 oz (250 g ) cream cheese – I use lite, Neufchatel, soft at room temperature. 1 tsp (5 ml) gf vanilla extract – don’t be heavy handed as it overpowers. 1 can – 8oz, 250 g- crushed pineapple in juice, drained well. 2. 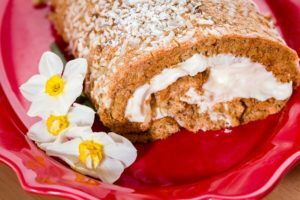 Spray a 10×15 jelly roll(swiss roll) pan and line with parchment (greaseproof) paper, pushing paper into the edges and corners and up the sides for overflow. Spray paper as well. 3. Put eggs, both sugars and vanilla in large bowl (stand mixer) and whisk for several minutes until mix is fluffy, increased in volume and whisk leaves trail in the egg mix. 4. Mix flour, xanthan gum, baking powder, spices and salt with shredded carrots. 5. Gently fold flour carrot mix into whisked eggs taking care not to deflate. 6. Spoon mix into jelly roll pan, gently spreading it to the corners and edges. Sprinkle with chopped pecans and coconut. These give a different texture and help stop cake from sticking to dish towel when cooked and turned out. 7. Bake in preheated oven for 15 minutes, checking at 12 minutes. Cake should have risen almost level with top of pan, nice light golden color and feel cooked but soft fluffy. 8. Remove from oven, place lint free towel on top of cooling rack, place rack with tea towel on top of cake, flip and remove jelly roll pan. Tear small pieces of the parchment paper off the cake. If you try and tear large pieces, cake can be caught and tear. 9. Loosely roll cake with lint free towel caught inside to make a short fat roll. I leave for only about 15-20 minutes to cool down. If you leave cake for 45-60 minutes, then it cracks when you unroll. If you don’t feel confident rolling cake, then cut it into 2 or 3 strips in either direction and stack like a layer cake. It will taste just as good. Beat really soft butter and cream cheese together. If they are hard then you won’t get smooth mouth feel and little blobs of hard butter and cream cheese will be visible. 11. Unroll jelly roll after 15-20 minutes. It won’t lie flat. If it is still quite warm in the middle, let it cool for about another 15 minutes. Gently spread filling to edges, trying to make filling reasonably even. Make sure you spread to the edges, nothing worse than no filling. 12. Spread with drained crushed pineapple, there isn’t that much. 13. Re-roll with seam underneath, place on serving plate and refrigerate or serve immediately. 14. Remove from fridge so filling can soften. With butter it can stiffen to piping consistency. I've made regular carrot cake for years – I always had to make one for a friends party, Rick had the carrot cake (even at Christmas) and Karen had my chocolate peanut butter cheesecake. I know, I get told by friends what dessert to bring to a party and it doesn't matter that it's gluten free and they're wheat eaters, it still gets demolished. I was tweaking this recipe and took it to a chamber of commerce luncheon as I really don't need a full size jelly roll in the house. One of the young men came back for seconds, said I could make it for him anytime and had no idea it was gluten free. I always try and simplify my recipes as none of us have time for involved methods and lots of dirty dishes. I saw one recipe that cooked the carrot and puréed it. That just didn't work for me. I tried cooking shredded carrot in the microwave, but it didn't make a difference, took more time and dirtied another dish. I like the shreds of raw carrot, gives texture and does cook in enough time. I prefer the finished cake served at room temperature, the filling softens and the whole jelly roll melts in your mouth. Don't worry about length of recipe, it's easy and I try to give as much advice as possible to help you.